We care for our pets like our children and part of the family. Keeping them healthy involves regular checkups with the veterinary and knowing how to best care for them. Dentistry for pets has many of the same aspects of our own dental health. Exams, technique, proper hygiene habits, and tools and regular brushing. Many products are on the market that caters to the idea that their use promotes dental health, but there is more to it than giving your dog a bone. The first thing to educate yourself about how to care for your specific pet is to have a veterinarian exam. During these exams, the teeth, gums, and mouth are thoroughly examined and the vet will make a recommendation if a professional cleaning is required. They will note any problem areas and the general health of the pet. If you have never seen proper technique for how to care for your pet's teeth, then ask the vet to demonstrate. Most vets will be happy to teach you how to properly care for your pet and show you what to pay attention to. They also have great advice on what toothpaste (yes, there are pet kinds of toothpaste!) and brushes are most appropriate for the size and breed of your pet. Starting these practices while your pet is young will be the best way to provide for their dental health into their later years. These tips and others can be found for home care for dogs as stated by the American Veterinary Dental College. Pet supply stores and your local veterinary are sure to have a selection of toothpaste choices. These are formulated differently than human toothpaste, as they are less sudsy and their cleaning action is enzymatic. They use enzymes to help break down food debris and plaque and can be swallowed, so there is no need to rinse as we do with our toothpaste. Most pets prefer meat-flavored kinds of toothpaste, like beef and chicken over mint. A good idea is to try a small sample, and find one your pet likes to make everything go easier. Some pets can not tolerate a brush in their mouth. Brushes are familiar to us and used to offer good reach and mechanical cleaning action but they may not be the right tool for your pet. Be sure to ask your vet what type of brush size and softness is appropriate for your pet. A finger-tip "brush" or cloth, or even a mouth spray may be the right choice for your pet. Find out during your pets vet exam. It is great to learn new things and start new habits, but with pet dental habits, starting slowly is best. Do not expect to make this a daily habit as soon as you learn it is a thing that you should be doing. For one, it will help you not get bit. Secondly, it will help the pet get used to the process - naturally pets don't use brushes and toothpaste and rely on their own saliva. How Often do you brush your pet's teeth? Daily, like humans. But realistically, once or twice a week is good. Setting up a routine and a habit will help and you want your pet to get used to this new behavior. Dogs chew up and eat many chew toys so quickly that they are more toys than dental hygiene products. Also, these kinds of products can produce stomach trouble for them if they are consumable. 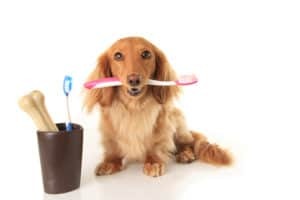 There are some products that are more durable and not consumable, and these can help with tooth and gum strength but they are not intended to be relied on to clean pets teeth. Be sure to choose a toy that is appropriately sized for your pet as well. You may also find biscuits that are marketed as "tartar control" or claim to be for dental health but these are more likely to fall in the category of "treats" than they are to provide real cleaning benefits. Dental disease is the #1 most common health problem seen by veterinarians. In the wild, the carnivore’s diet and eating habits keep the teeth clean and strong. However, typically commercial dry or canned food — does not. We have also created breeds that introduce a genetic component to pet health. 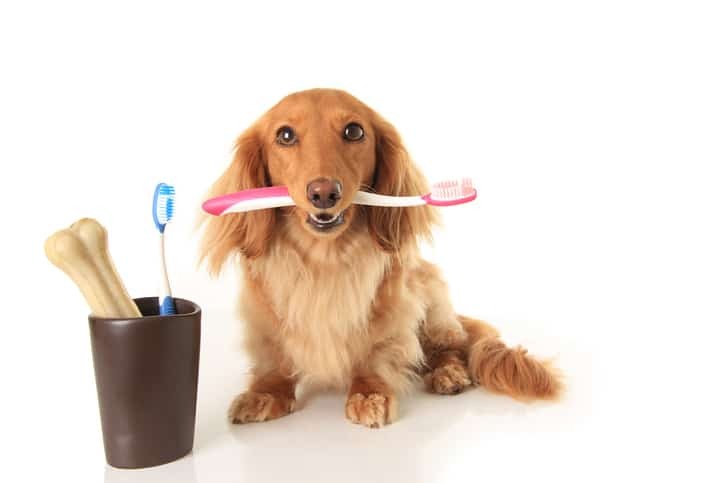 Therefore, proper dental care throughout your pet's life is essential to optimal health. Some breeds, such as Abyssinian cats and toy-breed dogs, have a tendency to develop severe gingivitis. Bulldogs, boxers, pugs, and Persian cats often have overcrowded, cavity-prone teeth due to their "smushed" faces. One myth is that "dry food cleans the teeth" - and dental health is directly impacted by the quality of a pet's diet. Major ingredients of low-quality foods (extreme processing, high carb, low moisture, by-product meal, corn gluten, and even sugars) introduce health risks such as obesity, diabetes, arthritis and kidney disease. Dental health and overall health are linked to diet and hygiene practices.